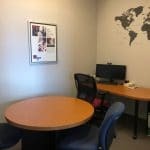 An ideal Vancouver-based facility for your next meeting. Small Business BC’s spacious and modern meeting rooms are available for rental. No matter what size your gathering our flexible choice of rooms can accommodate with no problems. All rooms come fully equipped with presentation, teleconference and video conference tools. We are housed within the storied confines of Vancouver’s Waterfront Station, where the Skytrain’s Canada and Millenium Line, Seabus and West Coast Express meet. We welcome outside catering, however the booking organization is responsible for all catering for the event. Small Business BC can recommend caterers upon request. Your room rental booking is confirmed when we receive your full fee payment, made by credit card (MasterCard or VISA), debit, or cash in advance. Room booking dates and times are non-transferable. All cancellations must be submitted by email. You will receive a 50% refund if your cancellation is received 10 business days before your booking. No refunds will be issued for cancellations received less than 10 days prior to your booking. Contact our Education Centre team below to find out more about availability and pricing.